In India, particularly in South India, many Hindu temples claim to have Swayambhu lingams. First of all, what is a Swayambhu lingam? These are the lingams that manifest on its own i.e. not made by man. They appear suddenly or mysteriously without any human efforts. They are self existing and when the saints or holy men see them they install them in a temple. We have several stories about great saints like Adi Shankara installing such lingams in several places. The famous Madurai Meenakshi temple has a Swayambhu lingam. Is there any science behind such spontaneous appearance of Lingams? Can stones rise from the earth by some special force? 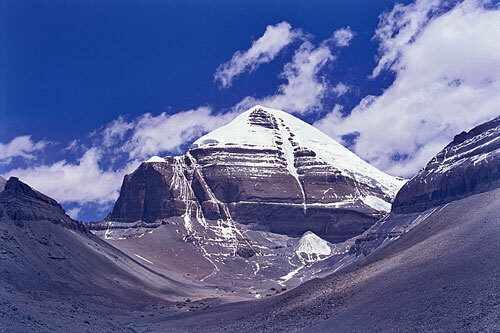 Some natural formations such as the famous Kailash Mountain or Tiruvannamlai hill look like Shivaling. This is nature’s work of art. Some are scientifically explained. The most famous Amarnath Ice Linga is formed by dropping water through the mountain crevices. But yet it is a natural wonder to see it in a particular season every year in Amarnath, Kashmir. Hindus see god in everything. They see it in music, dance, Prasad they eat, shoes holy men wear, foot prints seen on rocks, the Rangoli they draw in front of their houses in Tamil Nadu. They even see Shivlingam in a particular kind of flower. Hindus also collect certain natural objects like polished stones or Salagramam (fossils ) and do Panchayatana Puja. Kanchi Paramacharya Swaigal had explained it in his lectures. The stones or fossils collected from river Gandaki in Nepal, Red stone from Sonabhadra in Bihar, Crystals from Vallam in Tamil Nadu, Linga shaped Banalingam stones from river Narmada, stones collected from Swarnamukhi river in Andhra Pradesh are worshiped as Vishnu, Ganesh, Surya/sun, Shiva and Goddess Ambika respectively in the Five/Panchayatana Pujas. All these are nature’s work. No man made them. But there is another strange scientific phenomenon known as micro seismic activity that pushes the stones to the surface from the depth. Do stones rise from the depths by special force? A letter published in London Times newspaper on 20th May, 1994 (from the paper cuttings preserved in my storage cup board) explains this. Anne C.A. Silk wrote this letter in reply to a reader’s query. The letter gives some interesting information about “stone growing fields” in Chiltern Hills. (These Hills are not far from London). “There was a local industry of gathering the large flints, some the size of a fist, to sell to local builders by the roadside. There is a further reason for the ascending mode of flints and rocks worldwide, over and above the fork disturbance proposed by Brian Parker (May 14 letter). This is the natural extremely low frequency (ELF) seismic energy from deep within earth. Micro seismic activity from faults such as Church Stratton Fault, Mere Fault, Great Glen Fault, sub terranean settling and indeed traffic at roundabouts will generate ELF energy sufficient enough to vibrate rocks and stones to the surface. It is of relevance to note that ELF frequencies from 30 Hz to 300 Hz also cover brain waves in humans”. So we can conclude that Swayambu Lingams come from below the earth by ELF or some forces yet unknown to science. ஸ்வயம்பூ லிங்கங்கள் தோன்றுவது உண்மைதான் ! Are there any svayambhu yoni goddess! Why that has not happened. Always Linga only!